Seeking to best serve students, NMC faculty in two different departments brought half-full attitudes to problems that threatened student learning – and in the process, filled the metaphorical glasses to the brim. Beginning this semester, nursing students and Great Lakes Maritime Academy cadets will both receive important training more conveniently than in the past. Nursing students will receive training in electronic health records on campus instead of at Munson Medical Center. GLMA cadets will receive firefighting training required for licensure in Traverse City instead of Toledo, Ohio. Nursing instructor Gwen Tafelsky (above photo, center) worked with Munson to bring their staff to campus after discovering limited computer classrooms at the hospital made it difficult to continue to offer PowerChart electronic health records training there. 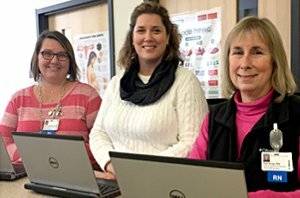 “We needed to look elsewhere to meet the needs for NMC,” said Deb Gray, RN, (above photo, at right) one of two Munson clinical EHR educators who will now come to campus to teach first-semester nursing students enrolled in the Informatics Essentials course. Maritime cadets, meanwhile, were faced with traveling as far as Florida or New York for firefighting training after the U.S. Maritime Administration announced last year that it planned to close its Fire Training Academy in Toledo, Ohio. 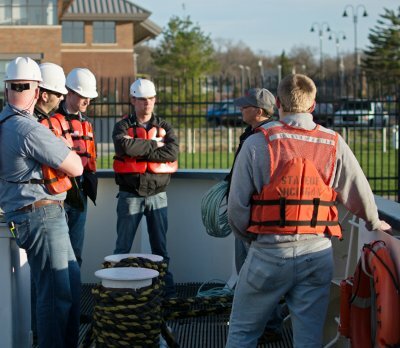 Instructor and Captain John Biolchini (at right in gray cap, with maritime cadets) worked with Tim Wrede, training coordinator at Traverse City’s Northwest Regional Fire Training Center, to create a local course that would fulfill U.S. Coast Guard requirements. “The two of them worked closely together and submitted a curriculum,” to the tune of 249 pages, said Jerry Achenbach, GLMA superintendent. The Coast Guard approved the curriculum with no edits or changes effective Jan. 1. Achenbach expects the 40-hour course to be offered for the first time in March and three times annually, saving cadets travel and hotel costs. Stephen Siciliano, vice president for academic affairs, praised both outcomes as exemplifying the dedication NMC faculty and staff show toward students. “Together they found solutions that not only solved the immediate problems facing our students but creatively established solutions that provide a much better future for our learners,” he said. Both solutions offer benefits beyond convenience. The EHR instruction strengthens existing NMC connections to the region’s largest health care employer. Nursing students near the end of their education already do clinicals at Munson. “It’s great when we have that collaboration right from the beginning,” said Tafelsky, herself a former staff nurse at Munson. Similarly, Kristi Noble, RN, another Munson educator who will teach on campus with Gray, is a former NMC adjunct instructor. She said the collaboration is an opportunity for students to make immediate positive impressions on their potential future employer. “View this next two years as a giant job interview,” said Noble (top photo, left). In the Maritime case, the firefighting training is expected to attract other sailors, meaning more tuition revenue coming into Traverse City. He added the Coast Guard has recently begun requiring that firefighting training certification be renewed every five years, which could present additional opportunities to the Training Center. Furthermore, MARAD plans to donate some of the Toledo facility’s equipment to the regional center.